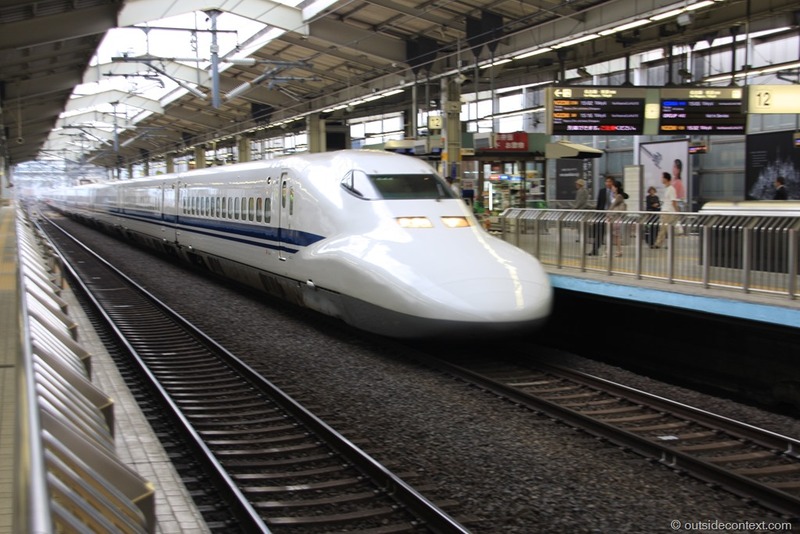 The bullet train pulled smoothly and serenely into the station, totally belying the speed it had demonstrated when blistering through the Japanese countryside. As I stepped down into the shiny and neat Kyoto station the entire history of Zen Buddhism flashed through my mind. 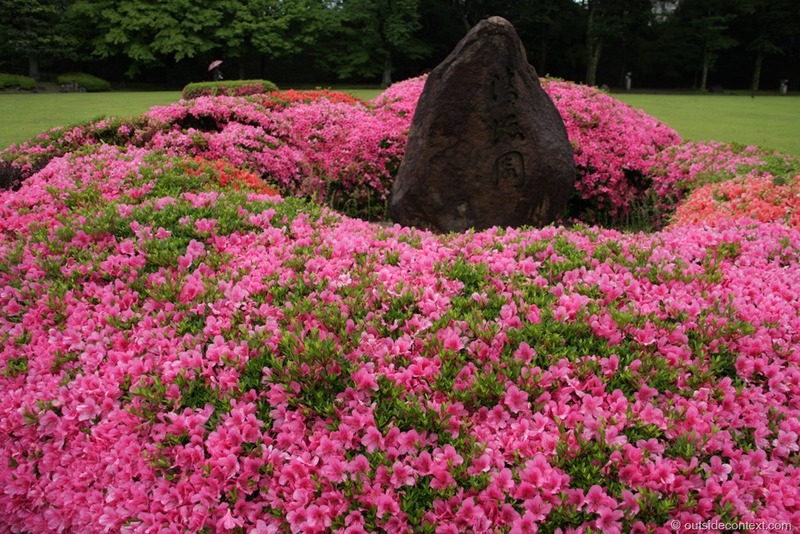 In short: this city was the last step before Zen came to the West. 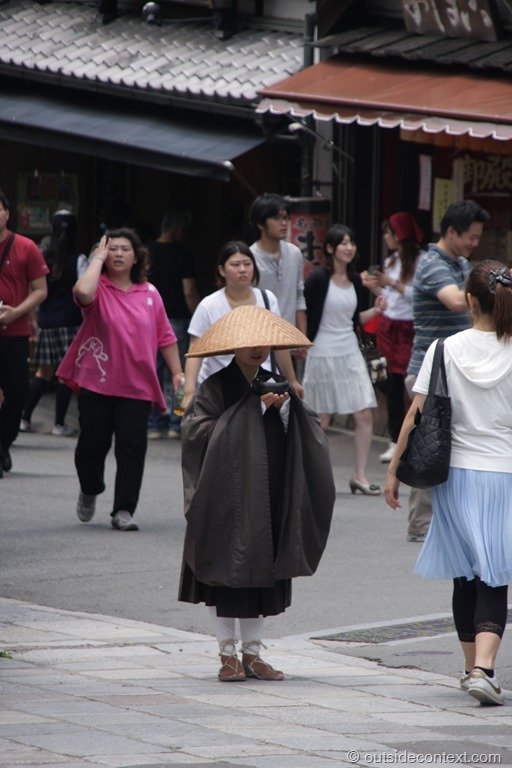 Kyoto is a city almost totally given over to the religions of Japan. Alike an Eastern, but much calmer, Rome. Much more so than I had imagined. We wandered from the station to our hostel which was more of a specialist guest house (ryokan) than anything we stayed in elsewhere. It was beautifully made of wood and traditionally laid out based on the size of the tamati matting. Our bed was a fold out futon in a very small room, but since we were the only people staying there we spent our time in the larger shared space. This shared room was my very idea of heaven. It was totally empty apart from a low table in the center. The sliding doors let in a good amount of natural light and the room was exceedingly peaceful. 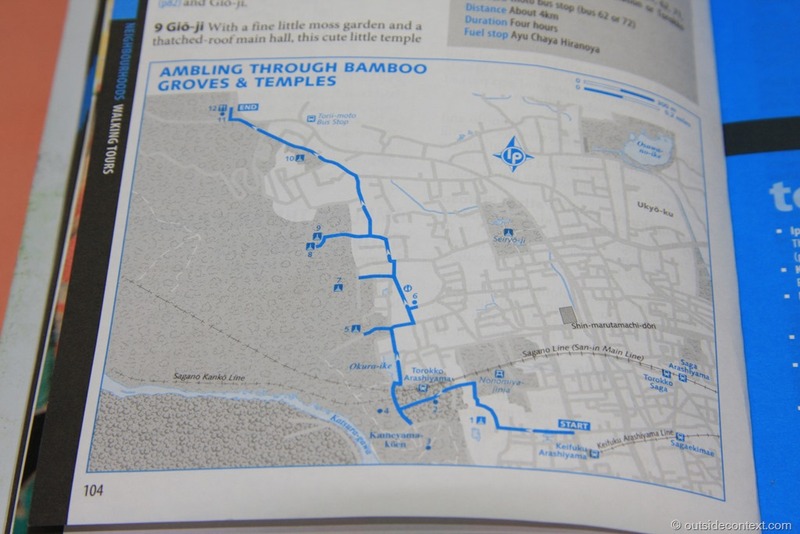 I sat there and felt totally calm and happy, while perused a map of Kyoto locations and planned our visit day by day. 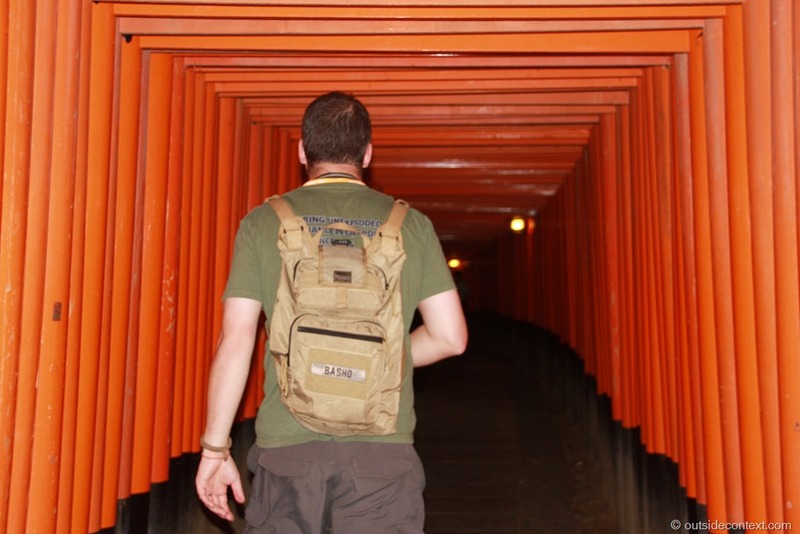 Basically, Kyoto is a historical city par excellence. If history, architecture, artistic beauty, Zen Buddhism and the samurai are not your thing, well – why on Earth did you come to Japan in the first place!? 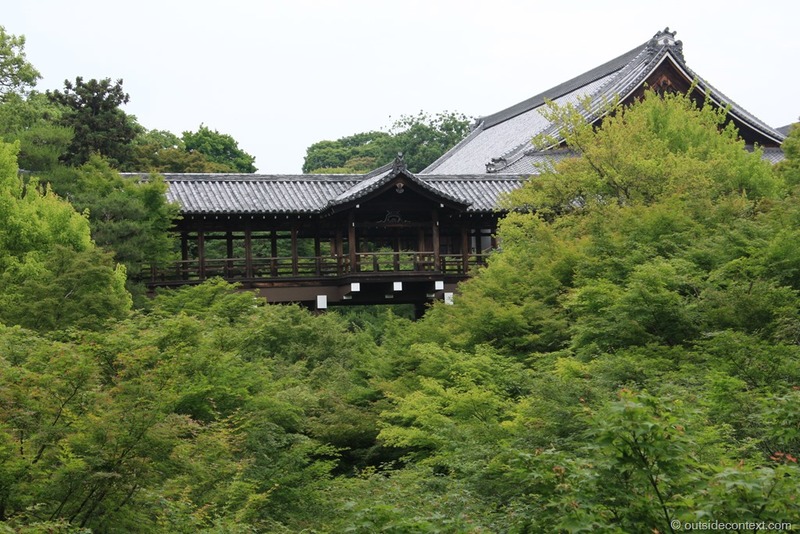 Kyoto was home to the Japanese emperor for 1000 years and the heart of Japanese Buddhism and Shinto. The city and tourist areas are roughly square in shape and the first of its tourist locations reachable either on foot or by local overland train. This is a doubly good thing as it is one of the most beautiful cities I have visited. Cesca dragged me out of the room and we wandered through the Higashiyama district, which lay against the lower slopes of the Mountains to the East, and marvelled at the historical recreation and preservation. 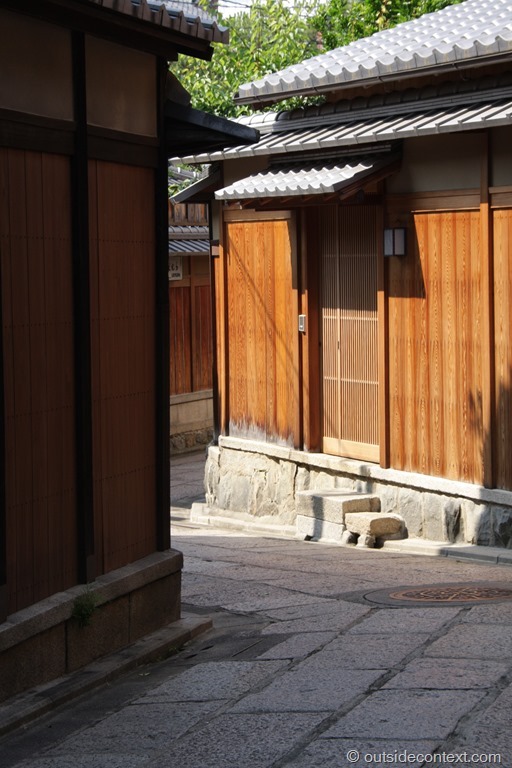 Wooden buildings line the old-style streets under which small traditional shops plied their fare. 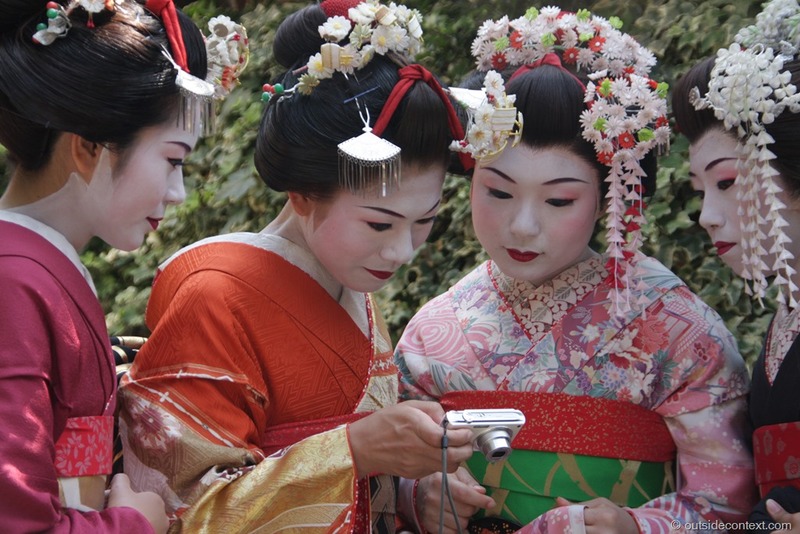 Around twisting stone paved alleys gaggles of Geisha titter into their hands as their photographs were taken by passing tourists. 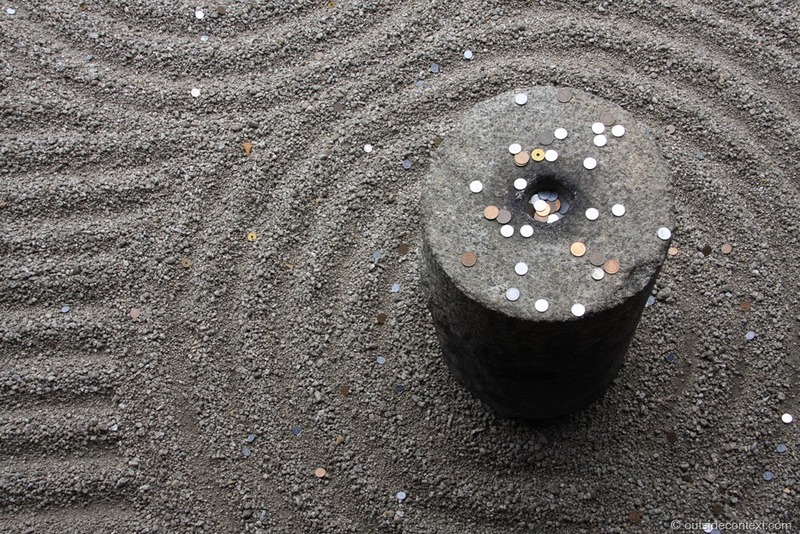 Zen monks stood silent and still, collecting alms. The warm climate led our steps invariably to food parlours where the quality level of Japanese ice-cream shamed those of my own city. Yes, heady and fantastical – a real trip into a long-ago world. I had been in city areas preserved in time for tourists before, from America through Australia and all around Asia, but no single location captivated me like this one. 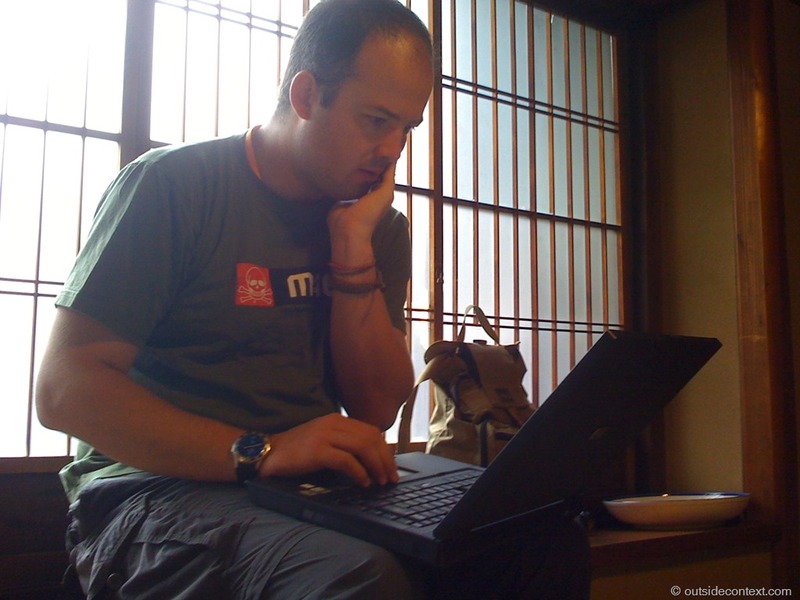 Unlike many of those other time-capsules this one had a real treat at the end in the form of Tofuku-ji temple. 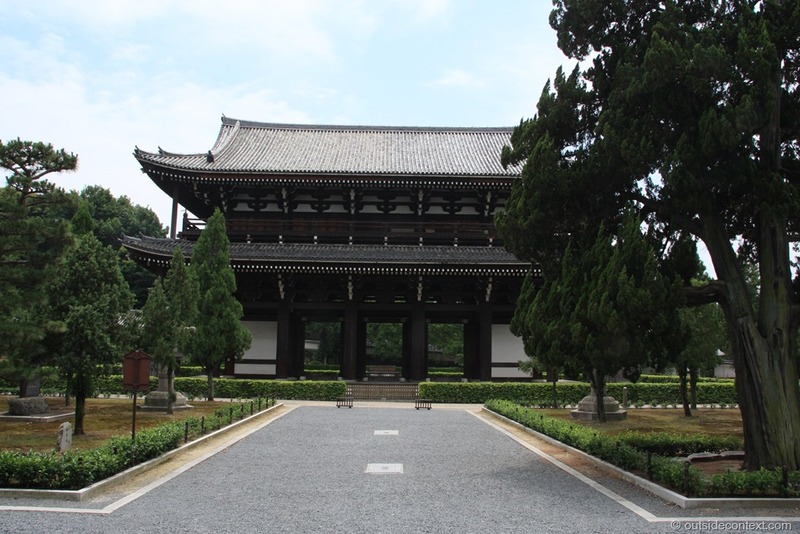 The entrance starts with an enormous, two storey, “gate” that tells all visitors in no uncertain terms that the Rinzai Zen sect of Japanese Buddhism built buildings to last. Indeed this complex has been in place since the 12th century. As we arrived at the temple, one I had spent a lifetime wanting to visit, I stepped up the stairs to be loudly and sternly told off by a Miko (temple lady) for having my shoes on. I took them off quick smart. Apologising to the lady, who was still chiding me, I asked if we could enter. 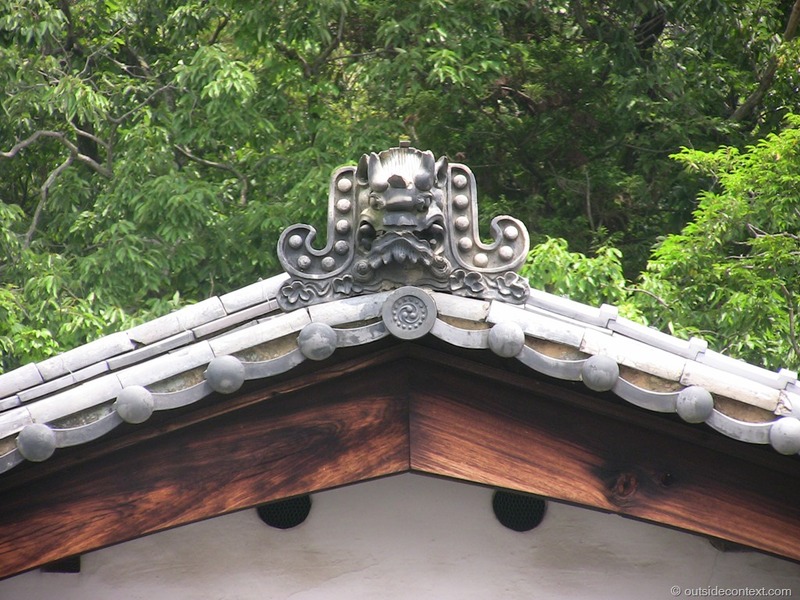 This particular “sub” temple was founded in 1346 and is justly famous for its history. 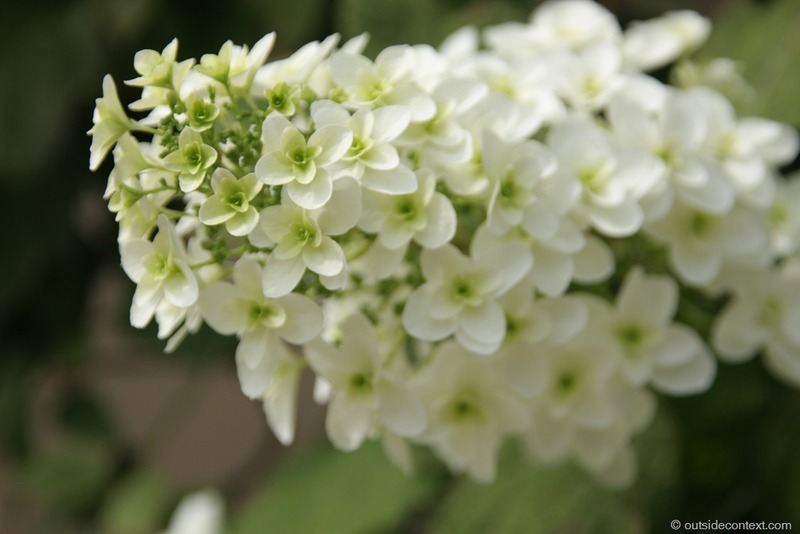 For example, in one of its halls the plan for the famous Battle of Sekigahara was drawn up. Walking through beautiful corridors we emerged into the gardens. 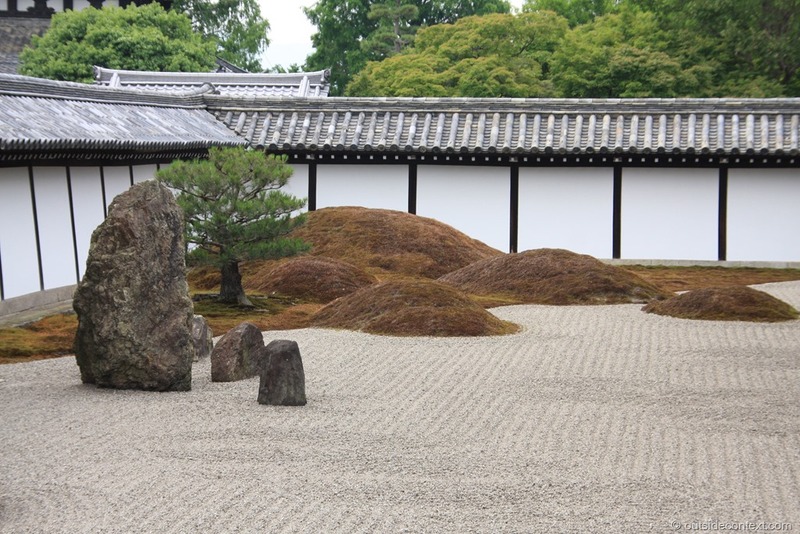 The first was situated against the wall of a large courtyard and was made of stones. 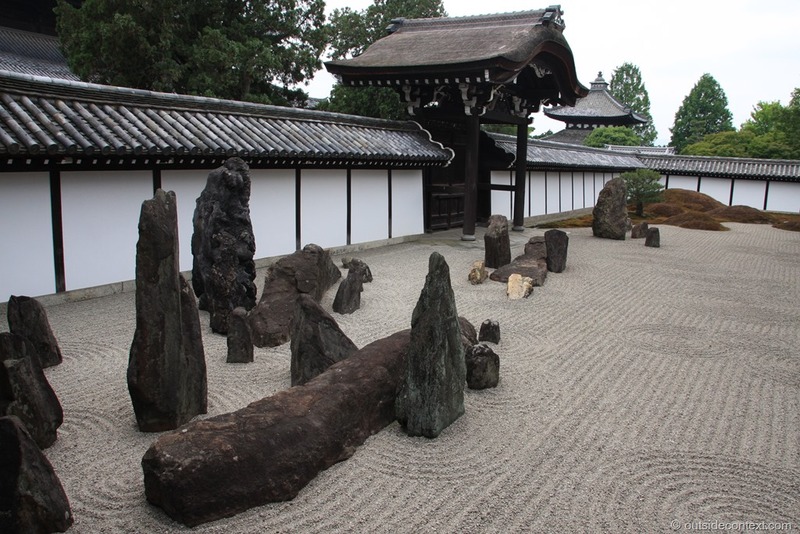 I had heard much about the stone gardens of the Zen temples, but nothing prepared me for first seeing them. The courtyard was lined by a wooden deck to sit and view the garden from. Cesca and I sat and looked at the shapes of the rocks. Quiet descended and we were one of only a handful visiting. The sun slowly moved across the sky. 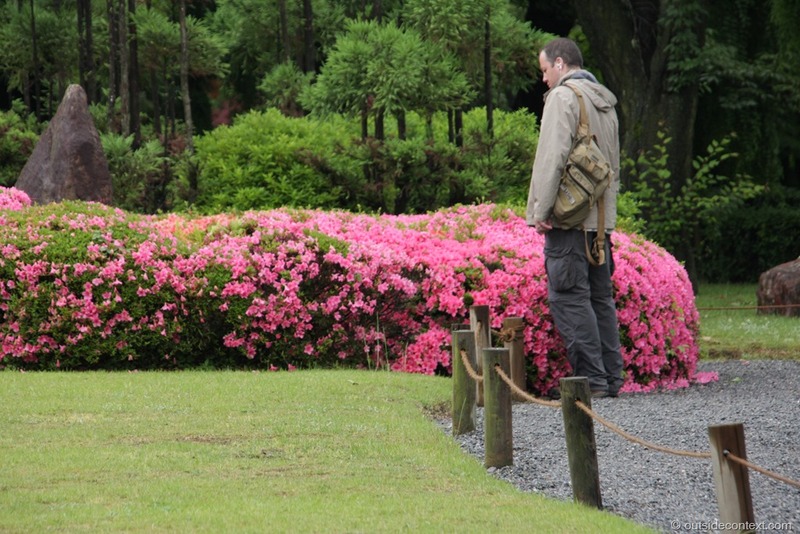 I considered the garden… and time disappeared. This question is a trick. The first line sets the scene. 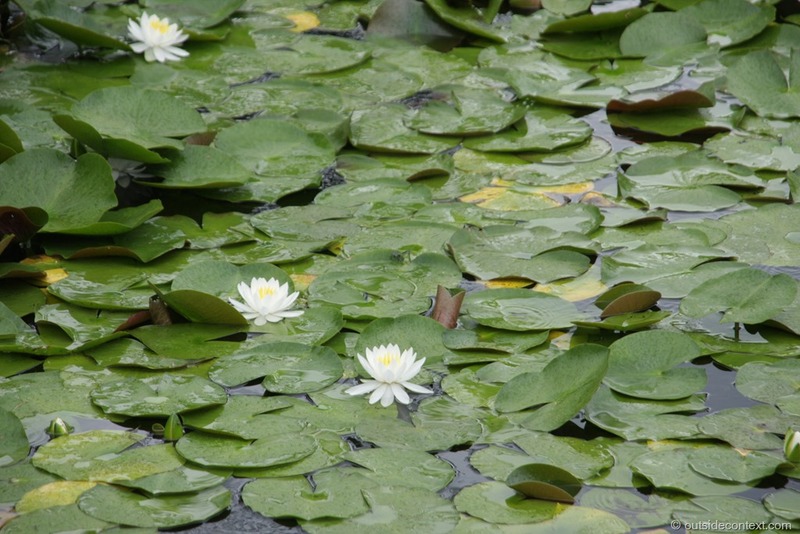 We imagine old ponds, lily pads and water. Then the second line conjures up the frog, the element of nature found in all Zen poetry and again something we imagine. The final line cuts across this imagined scene with a sound. 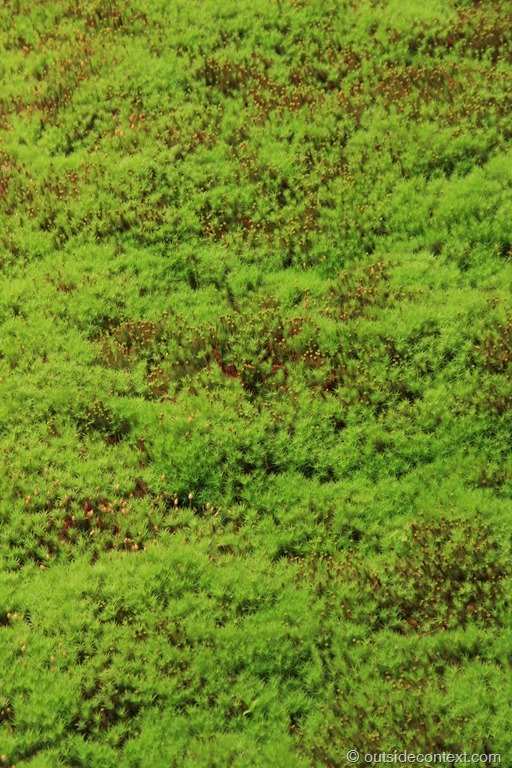 When we imagine a sound we almost “hear” it and that lets us feel, just for a fleeting second, that we are actually there by that pond hearing a frog jump in. One monk said, “The flag is moving”. The other said, “No – the wind is moving”. Huineng stopped to say, “No! Your mind is moving”. You ascribe a duality to yourself. That is, you have a mental point of view called “You” and this is distinct from everything else. 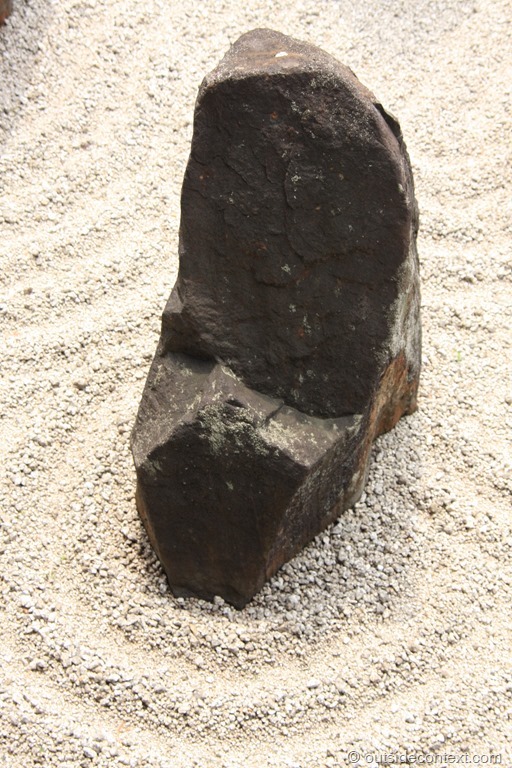 The purpose of a Zen garden is to show, by way of example, by way of a question with a sudden realisation of an answer, that there is no self, no duality of you and the Universe, you are *what the Universe is doing right now* and, eventually, this doing will stop. Your imagined self is just like the flag, just like the stones, no more than a “projection” your mind makes moment by moment. Now that, my friends, is gardening! We sat and felt the sun on us and everything else. After around 30 minutes or so, we clasped hands and squeezed silently then walked on. 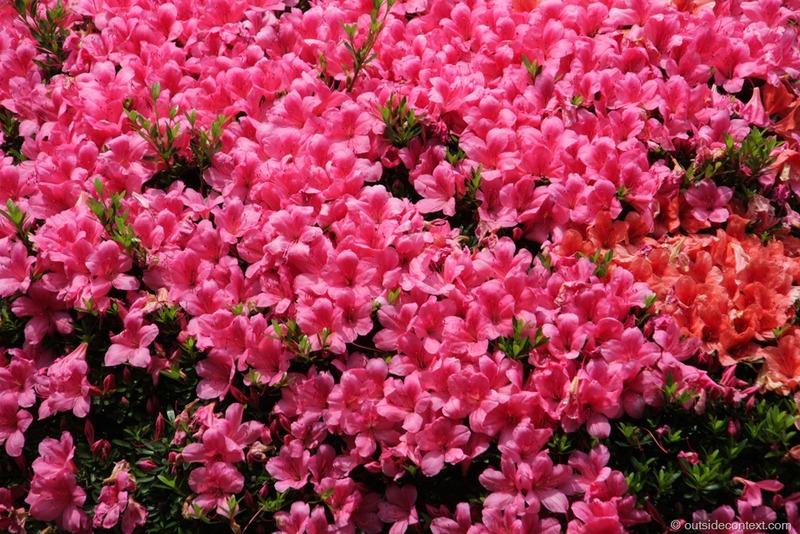 The next garden was very beautiful indeed. 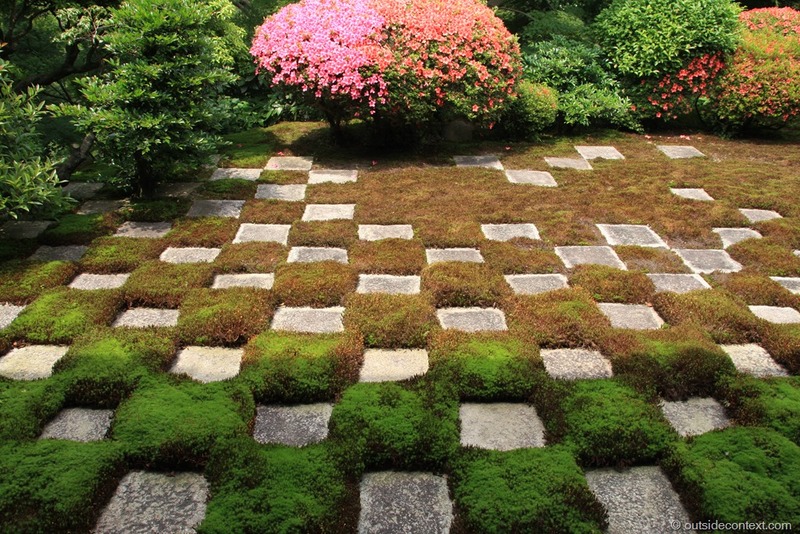 It had been planted completely in moss cut into incredible little square shapes. 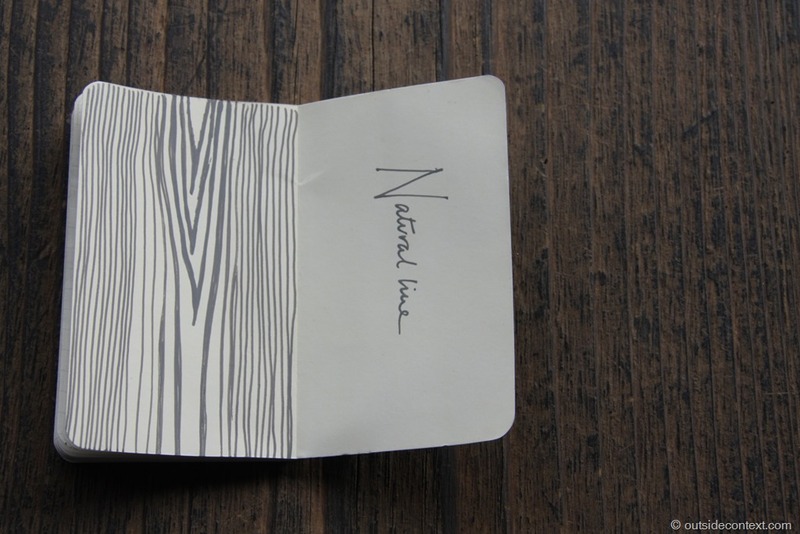 It was simple and elegant, refined and lovely. 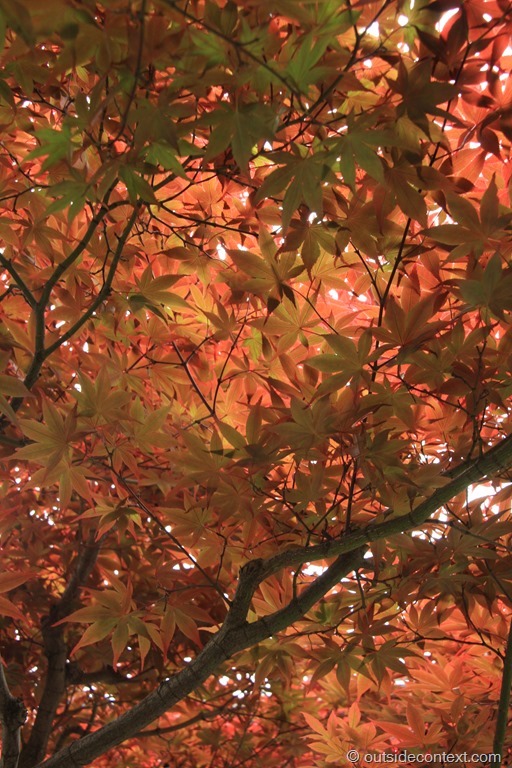 This led to an observation platform overlooking the cherry trees and some water in a wide stream. This is one of the famous places to come in April to see the cherry blossoms fall, a national symbol of the truth of life, and an obsession. As romantic as that sounds, this temple is probably rammed full to the rafters during those periods. I much preferred it when we were there because it was quiet and serene. I took a quick look into the monk’s rooms. The paintings were fantastic and I felt a sense of place. I was glad someone actually used this temple for what it was built for and had been doing so for nearly 800 years. Indeed my heart was finding peace in these temples. I wondered what it would be like to live in one and then I remembered the intense hardships of Zen and thanked the Dao that I didn’t. Doses of reality are one thing, living plugged into reality permanently must be a great hardship. What Terry Pratchett called being “knurd” (“drunk” backwards), which in his novels is a painful mental state (caused by imbibing too much of a certain coffee) where all comforting illusions are stripped away and reality – with all its attendant horrors – is grasped. Knurd people usually and desperately seek out strong drink to set the balance again. 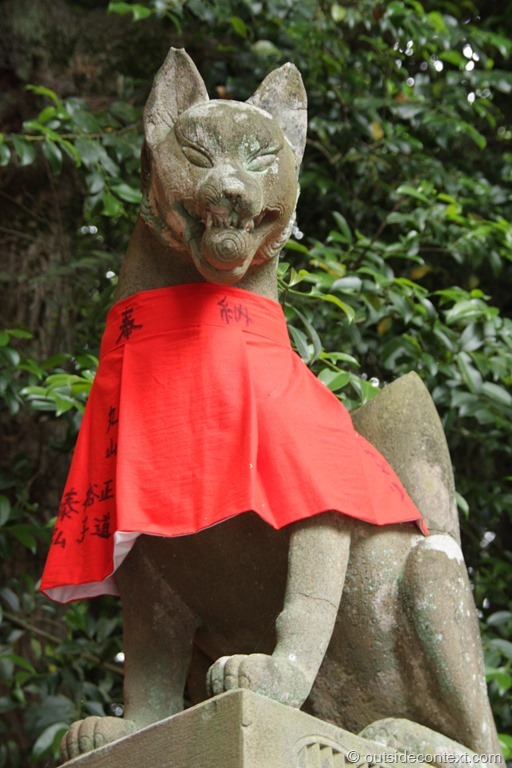 We left the Zen temple and decided to pay a visit to the home of the other great religion of Japan, Shinto. 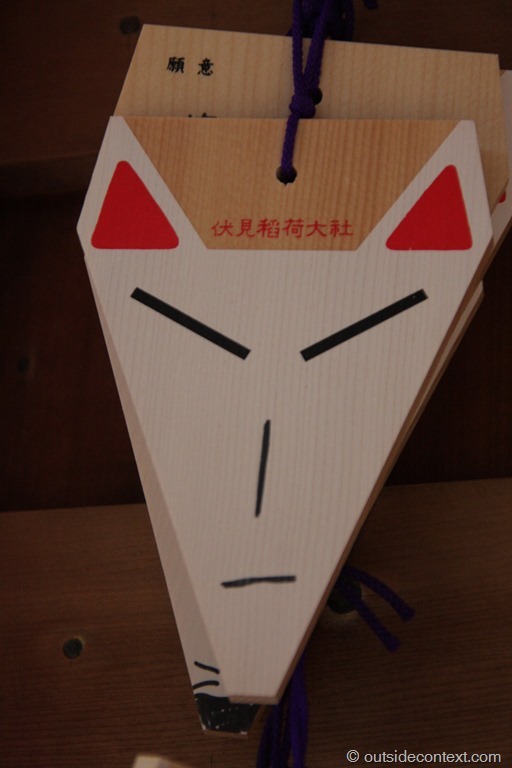 I understand Shinto very poorly. In fact my only exposure to it, before coming to its home, was through the work of the anime’s of Studio Ghibli. It is a form of worship, or veneration, to do with the idea that things have a Kame (Spirit) and these can influence your world. 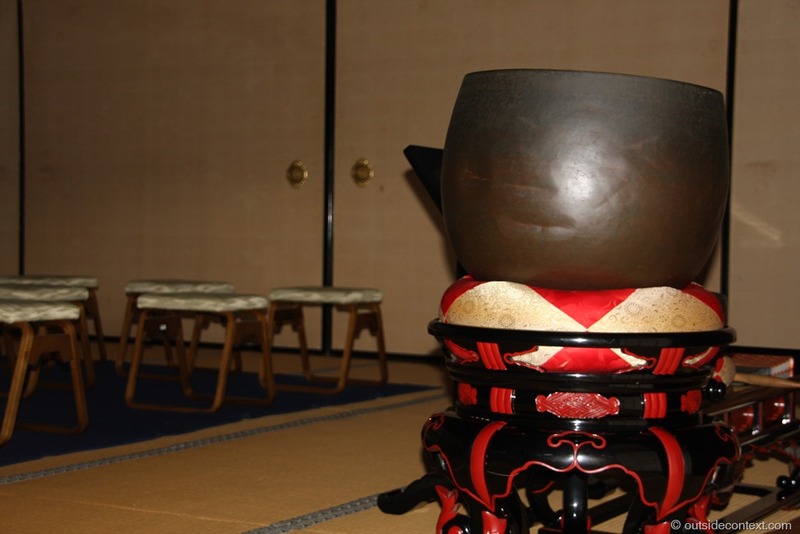 It had become the national religion of Japan, and put the Emperor on a divine pedestal, but I knew it went back over 2000 years and was therefore more a type of Folk Practice than formal religion. 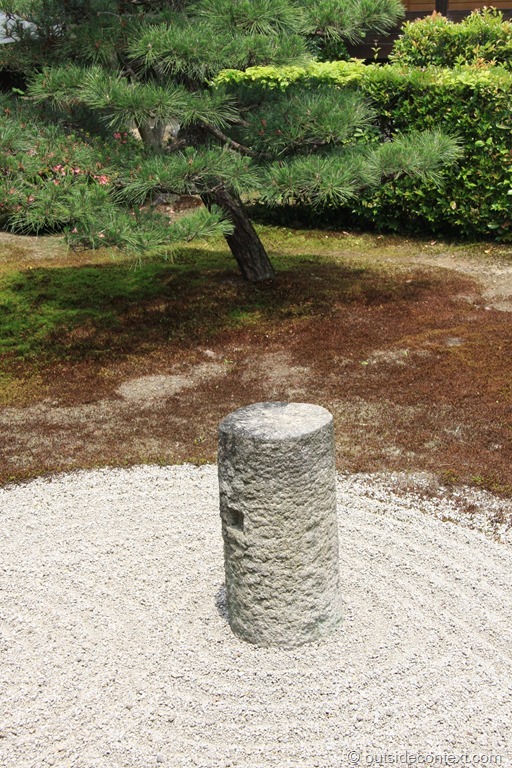 Much like Daoism then and the more I was to experience Shinto, the more I was to realise that it was descended from China’s Daoism in the same way Zen was descended from China’s Chan Buddhism. 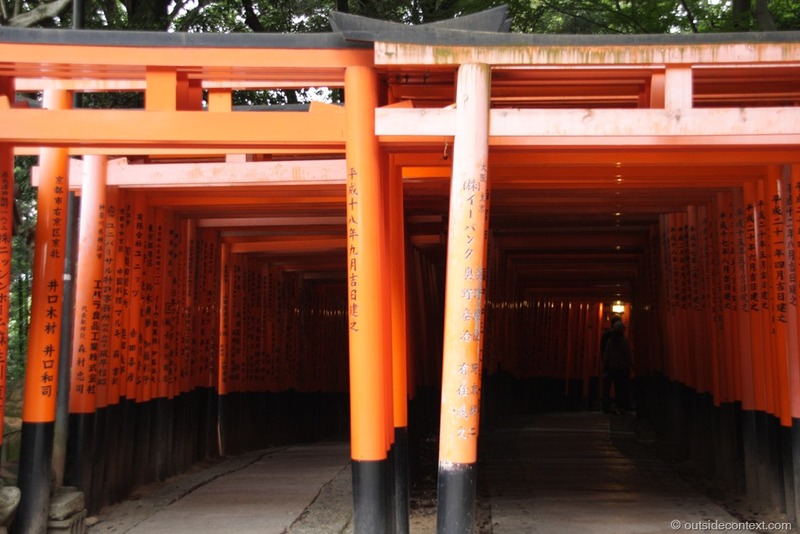 Fushimi Inari Shrine is probably the ultimate Shinto experience. The shrine runs up the side of a pleasant mountain walk through ancient forest, stopping at the various smaller shrines along the way. The mountain itself is considered holy and people have been wandering up here since 798AD. The most incredible sight was the collection of Tori gates at the base called Senbon Torii. There must have been a thousand of them stacked one after another and forming wooden tunnels up the hillside. 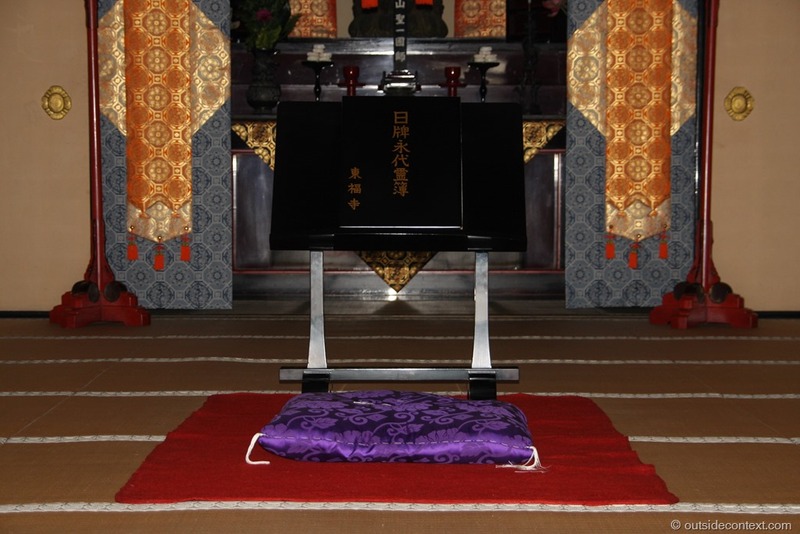 I read that each had been donated by a company to bring good luck and a blessing from the Kame. 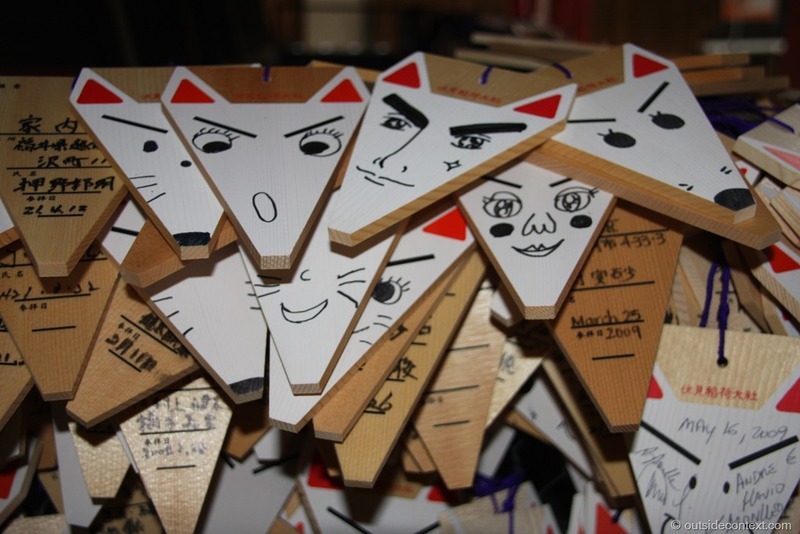 It was also obvious that school trips come out here as a large collection of folded paper faces, of a fox I believe, were hung around a shrine about half way up, but while we were hiking it was empty enough. At the top of the first path (about 45 minutes in and roughly half way up the mountain) it opened out into Yotsutsuji intersection, which has a very nice view over the city. Next, as a break from temples (even I can get “templed-out”), we visited Nijo Castle, which was built in 1603 for the Shogun, Tokugawa Ieyasu. 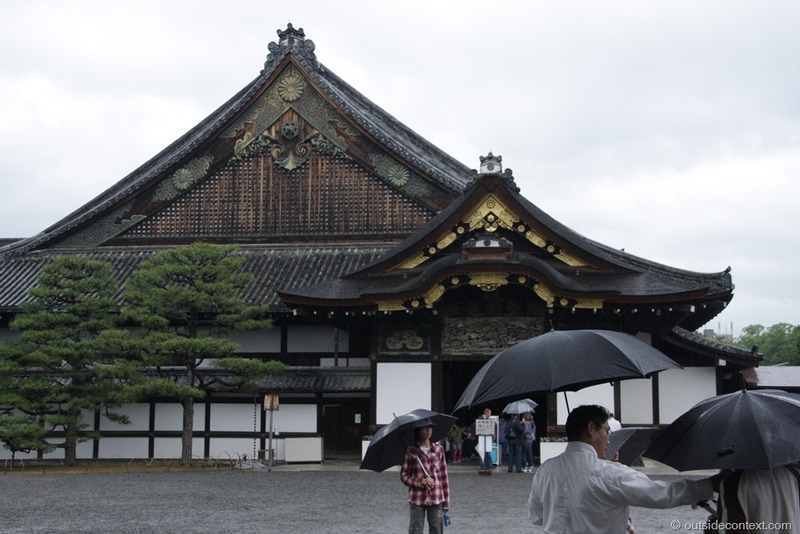 After the era of Shoguns passed with the Meiji Restoration, Nijo became an imperial palace for a while before finally being opened up to the public as a historic site. 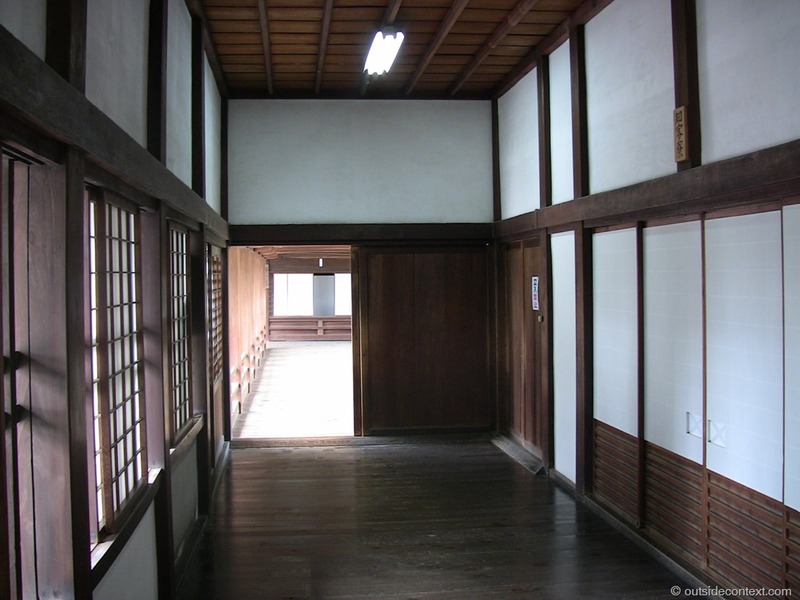 The castle itself is of the classic layout comprising dark wooden corridors (some with special “nightingale” floors that squeak to announce visitors) leading to simple but beautiful square rooms. 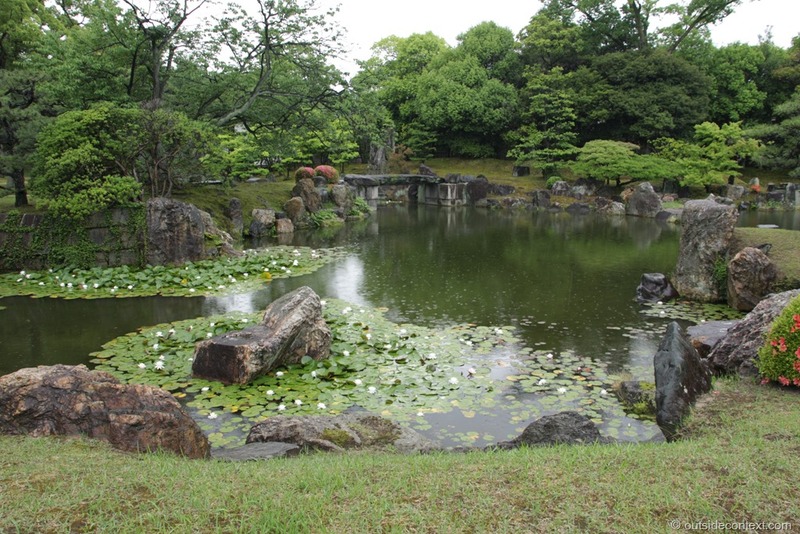 This was a fascinating view into the history of Japan’s strongest ruler, but it was the garden that really captured our attention. Around a large pond, this wonderful combination of stones, trees and flowers captivated both Cesca and I for a good couple of hours. I was finding Kyoto a very peaceful place to visit and we happily caught the train back to our guest house to plan our next few days adventures. We knew that soon, all too soon, we would be back home and this amazing year would be fading into memory. I started thinking of a plan to keep it alive.